Description: NVR72 trundles through the runaround move at St. Helena to position itself as the leader for the trek back to Napa; Saint Helena, CA. Description: NVR72 pulling the slack from the train as it chugs its way out of the siding at the St. Helena depot; Saint Helena, CA. 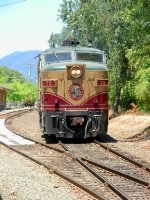 Description: NVR72 leading the Wine Train past the ex-SP depot at Rutherford; Rutherford, CA.